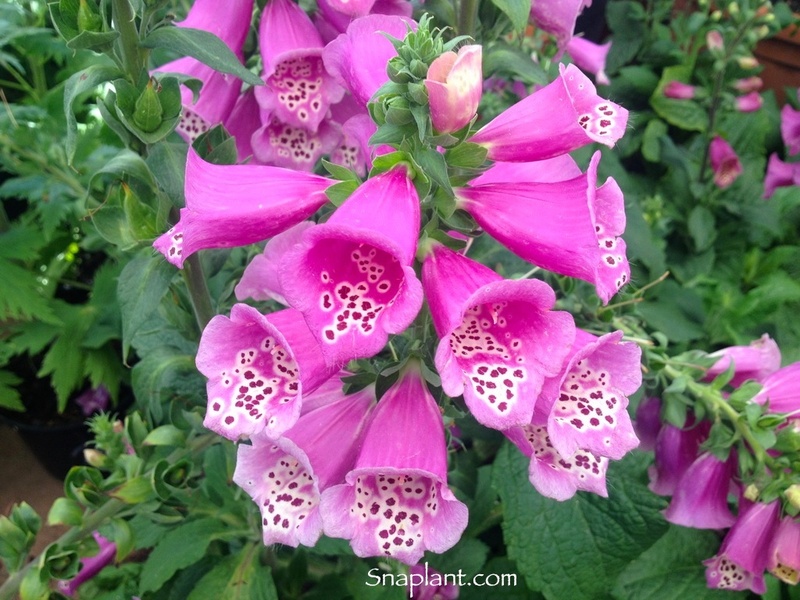 Share the post "Foxglove Or Digitalis Purpurea Facts And Interesting Information"
• The foxglove (Digitalis) genus (in the plantain family Plantaginaceae) consists of a group of biennial and perennial plants of which the common foxglove (Digitalis purpurea) is most well-known. It originates from Europe, but it is domesticated and widely spread in North America. • Some common names of digitalis are Dead man’s bells, Fairy finger, Fairy bells, Fairy thimbles, Fairy cap, Ladies’ thimble, Lady-finger, Rabbit’s flower, Throatwort, Flapdock, Flopdock, Lion’s mouth, and Scotch mercury. • Foxglove (Digitalis purpurea) is a popular garden plant and cultivated for ornamental purposes. • Foxglove was first known by the Anglo-Saxon name foxes glofa (the glove of the fox), because its flowers look like the fingers of a glove. This name is also thought to be related to a northern legend that bad fairies gave the blossoms to the fox to put on his toes, so that he could muffle his footfalls while he hunted for prey. • Foxglove is poisonous; it can be fatal even in small doses. Its sap, flowers, seeds, and leaves are all poisonous. Even dry leaves contain the largest amount of cardiac glycosides. The upper leaves of the stem are more dangerous than the lower leaves. Foxglove is most toxic just before the seeds ripen. It tastes spicy hot or bitter and smells slightly bad. During the early stages, the plant can sometimes be mistaken as Comfrey or Plantain. Making this mistake can be very dangerous and deadly. • Foxglove contains digitoxin, digoxin, and other cardiac glycosides. These are chemicals that affect the heart. Used improperly, foxglove is deadly; it can make the heart stop or cause a person to suffocate. • Heart-protective properties of foxglove were discovered in the 18th century. Digitoxin and digoxin, extracted from the plant are able to slow down the heart beat and increase the strength of contractions and prevent edema by facilitating removal of the excess water from the body. • Digitalis purpurea was the original source of the drug called digitalis. Modern medicine still uses Digitalis compounds in treatment of congestive heart failure. Digoxin (Lanoxin) is the most common drug made from digitalis. • In spite of its use in the past, foxglove has been largely replaced as a heart medicine by standardized pharmaceutical preparations because it is one of the most dangerous medicinal plants in the world. Foxglove therapeutic dose and the lethal dose are very close. • In folk medicine, foxglove was first used in Ireland. Its use spread to Scotland, England, and then to central Europe. It was taken to treat abscesses, boils, headaches, paralysis, and stomach ulcers. It was also applied to the body to help wounds heal and to cure ulcers. It has not been proven to be an effective treatment for any of these ailments. • Digoxigenin is a type of steroid obtained from the foxglove that has application in medicine. It is used in molecular biology for detection of DNA and RNA molecules. • Foxglove produces 20 to 80 purple-pink flowers arranged in the form of long spike. • Foxglove with white flowers is rare in the wild. Commercial hybrids come in many different colors like white, creamy, shades of pink and purple, yellow, and deep violet. • Foxglove blooms from June to September. Colorful flowers filled with nectar attract bumblebees, main pollinators of this species. • Foxglove produces only leaves during the first year of life. Flowering stem, flowers and seed are produced during the second year. That’s is why it is known as a biennial plant. • Foxglove produces around 2 million seeds in a lifetime. • Wild animals are aware of toxins hidden inside this plant and they avoid it. • Foxgloves overwinter in U.S. Department of Agriculture plant hardiness zones 3 through 9, depending on the variety, and the common foxglove overwinters in USDA zones 4 through 8. All varieties prefer partial or full shade, except in cooler climates, where they prefer full sun. Most foxgloves perform best in well-draining, humus-enriched soil but can tolerate many different soil types and conditions as long as they aren’t extreme. • To encourage more blooms, clip off the tall center spire after flowering. This will also help prevent reseeding if you want to limit the spread of this plant. Do you grow Foxglove (Digitalis Purpurea) in your garden? What is your experience with this plant? Please share with other fellow gardeners in the comments below! Do you sell Foxglove (Digitalis Purpurea) seeds or have plants for sale? You can place your advertisement here. Contact us now!